I began my UPMC journey as a student worker while I attended college. During my summer breaks, I worked in the revenue cycle, where I entered data into the UPMC Find a Doc files. During my time as a student worker, I met a lot of great leaders and colleagues within the revenue cycle. Upon graduating, I wanted to continue to learn and develop as a revenue cycle employee, so I began to explore job opportunities. My first full-time role within the revenue cycle was as a patient information coordinator within the floater pool. Throughout my UPMC journey, I have been fortunate to work for leaders who identify and acknowledge hard work and support the UPMC career ladder. Now, I’m a senior manager! 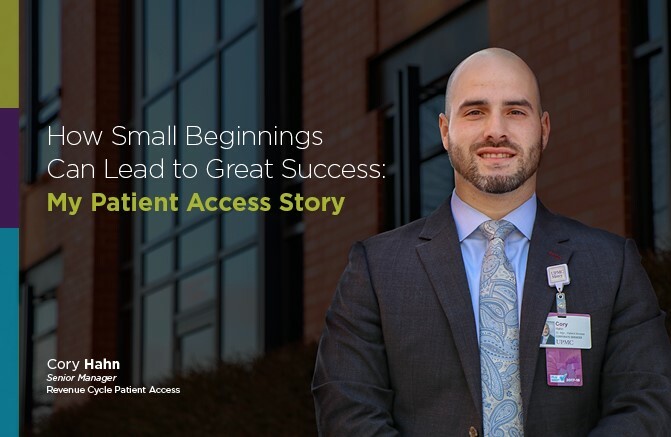 Throughout my UPMC journey, I have been fortunate to work for leaders who identify and acknowledge hard work and support the UPMC career ladder. The patient interaction is what I enjoyed most about my position as a patient information coordinator, and I strongly believe my time spent as a patient information coordinator created the foundation for my career trajectory. I believe the quote “People will forget what you said, people will forget what you did, but people will never forget how you made them feel” relates directly to the work of a patient information coordinator. As a patient information coordinator, you are likely the first UPMC employee that the patient will interact with; you set the tone for the patient’s visit. Hospital visits can naturally cause anxiety for patients, and I have always taken pride in my ability to greet each patient with a smile and empathize to reduce stress. As a patient information coordinator, you are likely the first UPMC employee that the patient will interact with; you set the tone for the patient’s visit. Experiencing the joy caused by such small tasks as providing a blanket to a cold patient or making coffee for a family member who has spent countless hours sitting with their loved one has always been the most rewarding part of the job. Aside from patient interaction, the countless wonderful coworkers I have had the privilege to work with have been what’s made my UPMC experience. The UPMC core values help recruit employees who exhibit qualities such as caring and listening and dignity and respect. I have worked with many great colleagues who have provided support throughout my career, and leadership has always taken time and provided a platform to discuss career development. It is rewarding working in an industry that is driven by serving others. It is rewarding working in an industry that is driven by serving others, and my goal is to continue to grow within the organization and learn as much as possible.